The trio of doctors at Advanced Spinal Fitness work to improve the health of and inspire the greater Charlotte community. Please read the articles below that highlight the accomplishments of ASF. Dr. Nicole Whitehead authored an article on the Webster Technique and its role in minimizing breach presentations in expecting mothers. Dr. Nicole is one of a few chiropractors in North Carolina certified in pediatrics and prenatal chiropractic by the Academy of Family Chiropractic Practice. To read the article featured in Issue 14, please click here. Dr. Serena Murray was spotlighted in the "Woman to Watch" feature in the September 2013 issue of Lake Norman Woman Magazine. Read the full article here to learn more about her philosophy on family, nutritional health, and healing. Dr. Lynne Kushnirenko was highlighted in an article titled "The Beauty of Plan B" in an issue of Lake Norman Woman Magazine. Read the full article here to learn how a former Canadian gymnast had a dream of being a chiropractor. 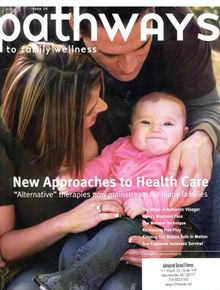 Dr. Nicole Whitehead was featured in a story titled 'Relying on Instinct' in the September 2011 issue of Lake Norman Woman Magazine. Read the full article here to learn more on how she has followed her gut through turning to down a college acceptance to meeting her husband and following her goals.